It was recorded that the great Patriarch Zhang San Feng drew his inspiration to evolve Wudang Kungfu, which later developed into Taijiquan, from Shaolin after witnessing a fight between a bird and a snake. Later some scholars suggested that the bird could be a sparrow, which was unlikely as a sparrow was too small for a snake. 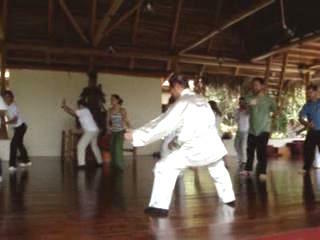 Some suggested that it could be a crane, which was more likely, especially when there are crane patterns in Taijiquan. It was also likely that this bird was an eagle, as many chin-na techniques in Taijiquan employs the Eagle Claw. Hence, when Sifu Rama Roberto proposed the name "Eagle Claw Catches Snake", Grandmaster Wong readily agreed it was an excellent choice. The two masters were enjoying tea on the Blue Mountain. Grandmaster Wong mentioned that the "Taijiquan Four-Direction Four-Attack Set" and the "Shaolin Four-Sequence Four-Direction Set" were the only two kungfu sets in Shaolin Wahnam that were not poetically named. He said that it might be a good idea to have a poetic name for each of them. Like all the other combat-sequence sets, the name "Old Eagle Catches Snake" is taken from a signature pattern in the set. It reminds us of the great gift Zhang San Feng gave us when he evolved Taijiquan from Shaolin Kungfu after witnessing a fight between a bird, which could possibly be an eagle, and a snake. It also reminds us of the many chin-na techniques in Taijiquan. "Old Eagle Catches Snake" was formerly called "Taijiaun Four-Direction Four-Attack Set". It is composed from the 4 Abridged Combat Sequences of Wahnam Taijiquan. These 4 abridged combat sequences were first taught in Japan, and then in Portugal. The sequences were revised on the Blue Mountain to make them more systematic for learning. The 4 combat sequences performed in solo as well as the Portugal version of the set are also presented below. Old Eagle Catches Snake from Wong Kiew Kit on Vimeo. Four Combat Sequences of Old Eagle Catches Snake from Wong Kiew Kit on Vimeo. Old Eagle Catches Snake in Portugal from Wong Kiew Kit on Vimeo.